Learn the techniques of ply-splitting by using these kits. You can go to my Cords page for details about ordering individual cords. See my Tools page if you need a gripfid (the ply-splitting needle) or the Bradshaw cordmaker. Scroll down to see more baskets. Click on any image to skip to the details about that basket. Kits for more ply-split baskets. Click on any image to skip to the details about that basket. $19.00 ..... Kit with instructions and artist-made 4-ply paper cords. $ 6.00 ..... Instructions only, if you want to make your own cords. $13.00 ..... Artist-made paper cords only, if you already have the instructions. The Spiral basket start consists of 4 long cords added by ply-split darning. Cords are worked as a spiral SCOT braid, with an edge cord at the fell frequently splitting previously-worked braid to create a bowl shape. Instructions show how to finish by wrapping the braid with a Dark cord and unplying all cords. Alternatively, you can hide the cord ends. Finished dimensions: 2" tall x 5" wide, not including fringe. The instructions in the kit are from my book How to Make Ply-Split Baskets, 10 pages of step-by-step instructions and 27 black and white photos. I will make 4-ply cords for you from a paper ribbon by Berwick called Wraphia II. You will receive 4 cords, approximately 120" long, 3 Dark and 1 Light. Choose two colors with good value contrast from the color chart for paper cords. You will need a size 9 gripfid to make this basket. The Kit, write "Spiral Basket Kit" and color names ($19.00). Instructions only, write "Instructions only for the Spiral Basket" ($6.00). Cords only, write "Cords for the Spiral Basket" and color names ($13.00). $24.25 ..... Kit with instructions and artist-made 2-ply, 2-color paper cords. $ 8.00 ..... Instructions only, if you want to make your own cords. $16.25 ..... Artist-made paper cords only, if you already have the instructions. The Waffle Basket has an octagonal base, and rounded, open sides in POT (plain oblique twining) with extra twist between the splittings. A long rim cord creates a rim by circling the basket 4 times, and ends in decorative knots. The instructions in the kit are from my book How to Make Ply-Split Baskets, 14 pages of step-by-step instructions with 33 black and white photos. I will make 2-ply, 2-color cords for you from a paper ribbon by Berwick called Wraphia II. You will receive 5cords, approximately 120" long. You will tape and cut them as necessary to the correct lengths specified in the instructions: 24 cords, 20" long; and a rim cord 120" long. The Kit, write "Waffle Basket Kit" and color names ($24.25). Instructions only, write "Instructions only for the Waffle Basket" ($8.00). Cords only, write "Cords for the Waffle Basket" and color names.($16.25). $22.50 ..... Kit with instructions and artist-made 4-ply paper cords. $16.50 ..... Artist-made paper cords only, if you already have the instructions. The Chameleon basket starts with a flat, squarish base, using only Light cords, perpendicular to each other. The cords making up the base become spokes for the sides of the basket. One long decorative cord is used for sides and rim, which circles the basket as cord ends are pulled through it. Detailed instructions and photos for making the decorative cord are included. Finished dimensions: 2" tall" x 3-3/4" wide. The instructions in the kit are from my book How to Make Ply-Split Baskets, 10 pages of step-by-step instructions and 22 black and white photos. I will make 4-ply cords for you from a paper ribbon by Berwick called Wraphia II. You will receive 2 Light cords 120" long, and a decorative cord for the sides/rim, 120" long. You will tape and cut the Light cords to the correct lengths specified in the instructions: 20 Light cords, 12" long. The Kit, write "Chameleon Basket Kit" and color names ($22.50). Instructions only, write "Instructions only for the Chameleon Basket" ($6.00). Cords only, write "Cords for the Chameleon Basket" and color names ($16.50). $32.00 ..... Kit with instructions and artist-made 4-ply, 1-color paper cords. $26.00 ..... Artist-made paper cords only, if you already have the instructions. The base for the Loopy basket starts with 2 cords, surrounded by concentric squares which increasingly curve as cords are added. Cylindrical sides increase in diameter as the basket grows by increasing the twist between splittings. Loops at the top edge, with all cord ends pulled back through the basket. Finished dimensions: 3-1/2" tall x 6" wide. I will make 4-ply cords for you from a paper ribbon by Berwick called Wraphia II. You will receive 4 Light cords and 4 Dark cords, approximately 120" long. You will tape and cut them as necessary to the correct lengths specified in the instructions: 16 Light cords and 16 Dark cords, 30" long. The Kit, write "Loopy Basket Kit" and color names ($32.00). Instructions only, write "Instructions only for the Loopy Basket" ($6.00). Cords only, write "Cords for the Loopy Basket" and color names.($26.00). $36.00 ..... Kit with instructions and artist-made 4-ply paper cords. $10.00 ..... Instructions only, if you want to make your own cords. The Venus basket has a 5-cord start, which leads to a pentagon and then to a 5-pointed star for the basket base. Shallow cylindrical sides have triangles extending from the star. A long rim cord circles the basket 5 times, as cord ends are pulled through it. Finished dimensions: 2-1/2" tall x 5" wide. The instructions in the kit are from my book How to Make Ply-Split Baskets, 16 pages of step-by-step instructions and 42 black and white photos. I will make 4-ply cords for you from a paper ribbon by Berwick called Wraphia II. You will receive 5 Dark cords and 3 Light cords, approximately 120" long. You will tape and cut them as necessary to the correct lengths specified in the instructions: 20 Dark cords and 15 Light cords, 20" long, plus the rim cord, 120" long. The Kit, write "Venus Basket Kit" and color names ($36.00). Instructions only, write "Instructions only for the Venus Basket" ($10.00). Cords only, write "Cords for the Venus Basket" and color names ($26.00). $52.25 ..... Kit with instructions and artist-made 4-ply paper cords. $42.25 ..... Artist-made paper cords only, if you already have the instructions. The Arrowhead Basket has a 6-cord start, which leads to the appearance of six arrowheads for the basket base. The design on the cylindrical sides have the appearance of fletching (the feathers on the end of arrows). A long rim cord circles the basket 4 times, as cord ends are pulled through it. Finished dimensions: 7-1/2" x 6-1/2". The instructions in the kit are from my book How to Make Ply-Split Baskets, 18 pages of step-by-step instructions with 44 black and white photos. I will make 4-ply cords for you from a paper ribbon by Berwick called Wraphia II. You will receive 6 Light cords and 7 Dark cords, approximately 120" long. You will tape and cut them as necessary to the correct lengths specified in the instructions: 24 Light cords and 24 Dark cords, 30" long; and a rim cord 120" long. The Kit, write "Arrowhead Basket Kit" and color names ($52.25). Instructions only, write "Instructions only for the Arrowhead Basket" ($10.00). Cords only, write "Cords for the Arrowhead Basket" and color names ($42.25). $38.25 ..... Kit with instructions and artist-made 4-ply paper cords. $ 9.00 ..... Instructions only, if you want to make your own cords. $29.25 ..... Artist-made paper cords only, if you already have the instructions. The Asilomar Basket has an octagonal base, and rounded, open sides in POT (plain oblique twining) with extra twist between the splittings. A long rim cord creates a rim by circling the basket 4 times, and ends in decorative knots. Decorative fringe around the rim. I will make 4-ply cords for you from a paper ribbon by Berwick called Wraphia II. You will receive 4 Light cords and 5 Dark cords, approximately 120" long. You will tape and cut them as necessary to the correct lengths specified in the instructions: 16 Light cords and 16 Dark cords, 30" long; and a rim cord 120" long. The Kit, write "Asilomar Basket Kit" and color names ($38.25). Instructions only, write "Instructions only for the Asilomar Basket" ($9.00). Cords only, write "Cords for the Asilomar Basket" and color names.($29.25). $21.25 ..... Kit with instructions and artist-made 4-ply paper cords. $ 5.00 ..... Instructions only, if you want to make your own cords. The ply-split Business Card Holder has a flat, rectangular base, with cords perpendicular to each other. Dark and Light cords are arranged and split following a pattern graph to create a zigzag design. A long rim cord, plied DLDL, forms the sides of the basket. The rim cord circles the basket 7 times, as cord ends are pulled through it. Finished dimensions: 4-1/2" long x 2-1/2" wide x 1-1/4" tall. The instructions in the kit are from my book How to Make Ply-Split Baskets, 8 pages of step-by-step instructions and 21 black and white photos. I will make 4-ply cords for you from a paper ribbon by Berwick called Wraphia II. You will receive 2 Light cords and 2 Dark cords, 120" long, and a rim cord plied DLDL 120" long. You will tape and cut these as necessary to the correct lengths specified in the instructions: 5 Dark cords, 15" long, 9 Dark cords, 12" long, 4 Light cords, 15" long, 10 Light cords, 12" long, and the rim cord 120" long. The Kit, write "Business Card Holder Kit" and color names ($18.00). Instructions only, write "Instructions only for the Business Card Holder" ($5.00). Cords only, write "Cords for the Business Card Holder" and color names.($13.00). $81.00 ..... Kit with instructions and artist-made 4-ply paper cords. $73.00 ..... Artist-made paper cords only, if you already have the instructions. The ply-split Letter Tray starts with a flat, rectangular base, with cords perpendicular to each other. Dark and Light cords are arranged and split to create the appearance of an interlaced design. One long cord splits all of the other cords for several rounds to create sides. The long cord changes functions to become the rim cord as side cord ends are pulled through it. Cords are then unplied and trimmed. Finished dimensions: 5-1/2" x 11-1/2"; about 4" deep, including fringe. The instructions in the kit are from my book How to Make Ply-Split Baskets, 12 pages of step-by-step instructions with 32 black and white photos. I will make 4-ply cords for you from a paper ribbon by Berwick called Wraphia II. You will receive 10 Light cords and 10 Dark cords, approximately 120" long, and a Dark rim cord 250" long. You will tape and cut them as necessary to the correct lengths specified in the instructions: 15 Dark cords and 10 Light cords, 30" long, 33 Dark cords and 22 Light cords, 20" long; and a Dark rim cord 250" long. The Kit, write "Letter Tray Kit" and color names ($81.00). Instructions only, write "Instructions only for the Letter Tray" ($8.00). Cords only, write "Cords for the Letter Tray" and color names.($73.00). $77.00 ..... Kit with instructions and artist-made 4-ply paper cords. $12.00 ..... Instructions only, if you want to make your own cords. $65.00 ..... Artist-made paper cords only, if you already have the instructions. For the Zig-Zag basket, Dark and Light cords are arranged and split following a pattern graph to create a zig-zag design. The tendency of cords to curve as they change function is encouraged and emphasized. The sides are worked in continuous twined linkings which gives stripes with an open, almost lacy appearance. Separate cords on each of the 4 sides create a square rim, with a tassel in each corner. Finished dimensions: 8" wide x 4" tall, not including tassels. The instructions in the kit are from my book How to Make Ply-Split Baskets, 20 pages of step-by-step instructions with 41 black and white photos. I will make 4-ply cords for you from a paper ribbon by Berwick called Wraphia II. You will receive 8 Light cords, 8 Dark cords, and 4 cords plied DLDL, all approximately 120" long. You will tape and cut them as necessary to the correct lengths specified in the instructions: 36 Light cords and 36 Dark cords, 24" long for the base & sides; and 16 cords, 20" long and 4 cords, 30" long for the rim. The Kit, write "Zig-Zag Basket Kit" and color names ($77.00). Instructions only, write "Instructions only for the Zig-Zag Basket" ($12.00). Cords only, write "Cords for the Zig-Zag Basket" and color names.($65.00). $31.25 ..... Kit with instructions and artist-made 4-ply paper cords. $15.00 ..... Instructions only, if you want to make your own cords. The Firecracker ply-split basket has 2 identical hexagonal bases, placed one on top of the other. The Dark base is on the inside, and the Light base is on the outside. A ring of Dark cords outlines the bottom. The design on the basket sides is created following a pattern graph. A long Dark cord creates a rim. It circles the basket 6 times, as the Dark cord ends are pulled through it. Untwisted Light cords leap upward from the basket rim. Finished dimensions: 2" wide x 4-3/4" tall, not including untwisted Light cords. The instructions in the kit are from my book How to Make Ply-Split Baskets, 26 pages of step-by-step instructions with 57 black and white photos. I will make 4-ply cords for you from a paper ribbon by Berwick called Wraphia II. You will receive 2 Light cords and 3 Dark cords, approximately 120" long. You will tape and cut them as necessary to the correct lengths specified in the instructions: 12 Light cords and 12 Dark cords, 20" long; and a rim cord 55" long. The Kit, write "Firecracker Basket Kit" and color names ($31.25). Instructions only, write "Instructions only for the Firecracker Basket" ($15.00). Cords only, write "Cords for the Firecracker Basket" and color names.($16.25). $43.00 ..... Kit with instructions and artist-made 4-ply paper cords. $34.00 ..... Artist-made paper cords only, if you already have the instructions. 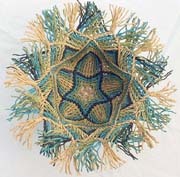 In the 8-Pointed Star ply-split basket, cords in the base are perpendicular to each other, and split following a pattern graph to create the design. Background cords are strung on a knitting needle so they are aligned vertically. Design cords are added one at a time. Every splitting involves a Dark and a Light cord, and cords are split to match the pattern graph. The sides are worked in POT (plain oblique twining) with extra twist between the splittings. A long cord creates a rim. It circles the basket 4 times, as cord ends are pulled through it. Finished dimensions: 3-1/4" tall x 9" wide. I will make 4-ply cords for you from a paper ribbon by Berwick called Wraphia II. You will receive 4 Light cords and 4 Dark cords, approximately 120" long, and a rim cord about 230" long. You will tape and cut them as necessary to the correct lengths specified in the instructions: 23 Light cords and 23 Dark cords, 20" long; and a rim cord 230" long. The Kit, write "8-Pointed Star Basket Kit" and color names ($43.00). Instructions only, write "Instructions only for the 8-Pointed Star Basket" ($9.00). Cords only, write "Cords for the 8-Pointed Star Basket" and color names.($34.00). You can also purchase the instructions separately in PDF format. Estas instrucciones también están disponibles en español. One summer I grew four kinds of garlic, so I designed a garlic basket! The large size would also be good for onions. 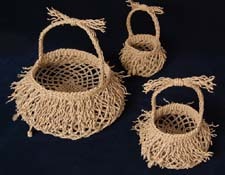 It is a good introduction to ply-split basketry. Make one for your kitchen and make gifts for your friends! The kit contains step-by-step instructions (text only) and commercially-made 3-ply paper Danish cord cut into lengths to make one basket in the size you choose. This basket has four structures: plain twining and single-course twining in the base, with POT on the sides, and SCOT for the handles. Extra twist left between the POT splittings provides an open structure -- you can leave less twist between splittings to change the size and shape of the basket. Instructions provide three alternatives for finishing the basket, depending on whether you like a wild-looking finish or something more tamed and tailored. A decorative knot finishes each end of the finishing cord. You will need a size 8 gripfid to make this basket. When ordering, please write "Garlic Basket Kit with Danish cords", and the size. Kit includes step-by-step instructions (text only) and 10 cords, 110" long, that I will make for you from 10/2 perle cotton (4 strands per ply with 15% shrinkage during initial overtwist). You will tape and cut them as necessary to the correct lengths specified in the instructions: 10 cords each of 4 colors, and 5 cords of the fifth color, 18" long. You will have some of each color left over, which you can use for experimenting. Choose five colors from the color chart for cotton cords. You will need a size 6 gripfid to make this basket. When ordering, please write "Lotus Basket Kit with cotton cords", 4-ply, 3/32" diameter, and color names. Kit includes step-by-step instructions (text only) and 10 cords, 110" long, that I will make for you from 5/2 perle cotton (4 strands per ply with 20% shrinkage during initial overtwist). You will tape and cut them as necessary to the correct lengths specified in the instructions: 10 cords each of 4 colors, and 5 cords of the fifth color, 22" long. 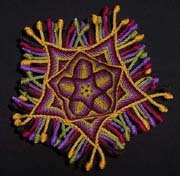 When ordering, please write "Lotus Basket Kit with 5/2 perle cotton cords", 4-ply, 5/32" diameter,and color names. Kit includes step-by-step instructions (text only) and 10 cords, 120" long, that I will make for you from a paper ribbon by Berwick called Wraphia II. The shrinkage during IOT is 15%. You will tape and cut them as necessary to the correct lengths specified in the instructions: 10 cords each of 4 colors, and 5 cords of the fifth color, 24" long. Choose five colors from the color chart for paper cords. When ordering, please write "Lotus Basket Kit with cords made from Wraphia II paper ribbon", and color names. Make this cute little holder for your gripfid and learn ply-splitting techniques at the same time. The knob on your gripfid becomes the little mermaid's head. Use a size 9 gripfid to make the mermaid. Order a gripfid . This kit contains cords that I will make for you from paper ribbon, and complete instructions (text only) for the design shown, as well as suggestions for variations. You will receive 3 cords, 120" long. You will tape and cut them as necessary to the correct lengths specified in the instructions: 6 cords 25" long and 6 cords 35" long. Choose up to 3 colors from the color chart for paper cords. When ordering, please write "Little Mermaid Kit", and color names. This color chart shows paper cords, 1/8" diameter. I use Wraphia II paper ribbon by Berwick to make these cords. This page updated April 11, 2017.